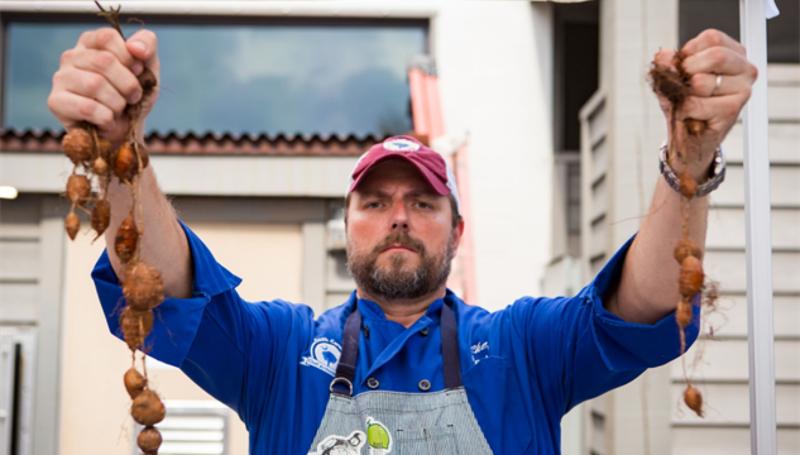 As a South Carolina Chef Ambassador, I’d be remiss if I didn’t bring up the incredible Restoration efforts going on now throughout the Southeast, and especially here in Charleston. Many varieties of heirloom and landrace grains are seeing a return, many having previously been written off as extinct. Here in South Carolina Abruzzi Rye, introduced in 1912, has long been prized by our bakers and by our farmers as a complimentary crop. Going back further, Seashore Black Rye was highly prized on the Sea Islands, and had been written off as extinct. It was found growing in one isolated patch on Edisto Island, has been repatriated to the marketplace by Greg Johnsman of Geechie Boy Mills. It had the honor of being boarded on to the Slow Food Ark of Taste last year. Glenn Roberts of Anson Mills also works closely with Dan Barber of Blue Hill / Stone Barn. Locally, we are blessed to have a partnership with Chris Wilkins of Root Bakery on Johns Island. There, he is using classic, artisan technique with the addition of Restoration ingredients, such as the Carolina African Runner Peanut. There’s a lot going on here. I’m honest when I say guests from off can experience truffles & foie from Barcelona to Singapore. In order to taste these flavors & this terroir you’re going to to have to come here. That said, both Seashore Black Rye and Abruzzi Rye are available online through the Geechie Boy and Anson Mills websites.